Barangay Burabod is a secluded area located at the foot of Mt. Isarog in Calabanga, Camarines Sur. Because of its remoteness and distance from the urban areas of the municipality, students in Barangay Burabod had to hike 5 kilometers to be able to reach the nearest school. Upon visiting the area a few years ago, former Camarines Sur Representative and now Vice President Leni Robredo had a chance to speak with Burabod’s Barangay Captain Roberto C. Cabaltera. They looked for possible ways to bring education closer to students and put up a secondary school in the location. After enlisting the support of various LGUs and government agencies, Severo High School in Burabod – named after Eduardo A. Severo, who generously donated a one-hectare lot – finally opened its doors to 123 enrollees last June 2014. As fate would have it, Typhoon Glenda hit the Philippines that same year, and devastated areas of Camarines Sur. Severo High School was severely damaged, leaving its teachers, students and entire community in dire need to repair its classrooms with the hope to make it far sturdier than the original construction. Not known to the people of Brgy. Burabod, events were already unfolding to address their need. Philam Foundation was coordinating with the Department of Education in identifying areas that were most in need of new classrooms under its “Philam Paaralan” program. 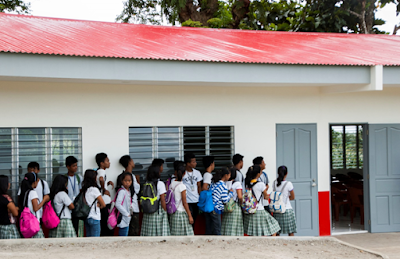 Its goal was to build classrooms in calamity-stricken and under-served communities. When Robredo explained the situation of Severo High School to Philam Foundation President Max Ventura, construction plans began to unfold. Apart from rehabilitation work that needed to be done, Philam Foundation successfully built two new Philam Paaralan classrooms for Severo Highschool, in partnership with the Happy Hearts Fund. “The act of physically building an educational structure is such a metaphor for deeper, more profound things,” explained Ventura. “Ultimately, we are building the knowledge of our youth and securing their future. Philam Foundation is thankful to all our partners and everyone who made it possible,” he added. “Aside from having typhoon-resilient structures, our classrooms are fully-furnished with water sanitation and hygiene facilities that will promote cleanliness and healthy living among students,” Ventura concluded. Established in 1997 to commemorate Philam Life's 50th Golden Anniversary, Philam Foundation, Inc. is the social development arm of the Philam Group of Companies. It is a non-stock, non-profit organization committed to serve the less privileged in society. To learn more about the Philam Foundation, visit www.philamlife.com.